Do you live in a big city where the number of wireless connections exceeds the number of people living there? On the one hand, you can use this to your advantage by always being able to find a free wireless signal when going through the city. On the other hand, too many WiFi connections can be a problem when you are surfing the web from the comfort of your home. That’s why it’s important to have a reliable tool that can manage all of your wireless connections. WiFi Manager is up next on our “operating table”. WiFi Manager may come across as nothing more than just a simple list of all the available wireless networks. And that’s at least partially the case. WiFi Manager can search for networks either automatically or with your click. Known networks: shows all previously accessed networks (whether they are within range or not). Additional important information is also displayed for those people that are interested in that kind of stuff: connection security, network channel and signal strength. Radar: A cool graph of all the networks around you displayed in the form of colorful ellipses. It gives you a good perspective of each network’s range. 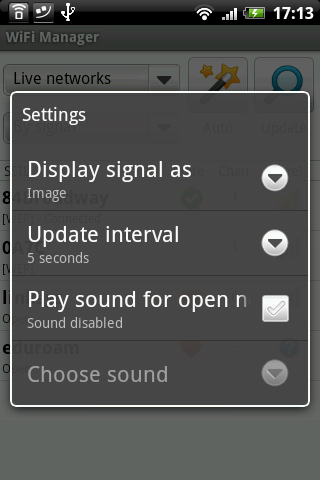 Settings: Some additional minor adjustments can be made. WiFi Network Switcher: This lets you switch between several different networks. If all you need to do is manage just one WiFi connections – this app isn’t for you. For those of you that use different WiFi connections throughout the day, however, this app could come in really handy. For example, in the office where I work, we have a ton of different WiFi connections. 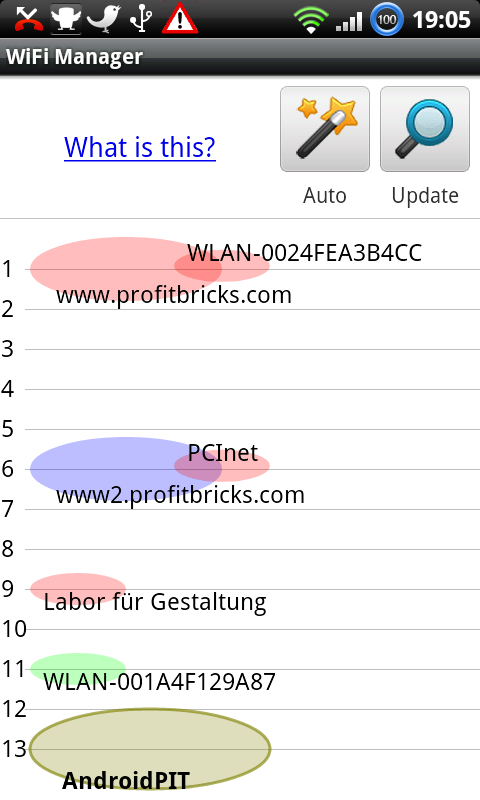 Using WiFi Manager I could finally visualize which networks where using which channels. That really helped us out here at work to clear up the WiFi confusion. The widgets are practical and useful, but nothing too exciting. Like many other Android Apps, WiFi Manager fails to live up to its expectations. I am not a fan of having to press the menu button to be able to access important features. There is no way of going from one screen to the other is impossible without pressing the menu button. Not cool! WiFi Manager is supposed to let you quickly and painlessly find wireless networks. There are two buttons available to do this: a magic wand and magnifying glass. With the magic wand the app checks for networks automatically and the magnifying glass searches for networks once.How the hell am I supposed to figure that out just by looking at them? It’s just plain confusing and annoying. Does anyone actually need to permanently search for wireless networks? Very odd indeed. WiFi Manager works perfectly. It even manages to detect networks with extremely weak signals. WiFi Manager can be downloaded for free from the App Center. Turn on WiFi just when you want. Usefull. Thanks, Maksim! We need that kind of commitment and dedication. Feel free to post suggestions or comments. We'd love to hear your input!